As the medium of comics has gained mainstream respect in recent years, several books have looked back on the unruly, disreputable origins of the art form. 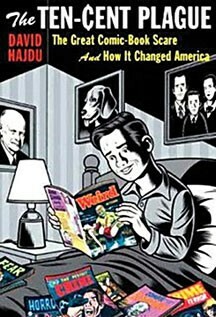 The most recent of these is David Hajdu's chronicle of the early days of the comic book, its rise to mass popularity and ultimate neutering under threat of government censorship. The early comics business was founded in large part by shysters, hucksters and hacks, with an occasional visionary like Will Eisner, the Orson Welles of comics, who saw from the beginning the artistic possibilities in what was then widely regarded as a trash medium. By the end of the '40s crime and horror comics were a large part of the market. William Gaines, whose father helped found the industry, started a line of comics under the Entertaining Comics banner that included Vault of Horror and Crime Suspense Stories.While the stories were gory, they were also sometimes darkly funny, and featured some of the best artists in the business, like Wally Wood and Jack Davis. In addition to the horror comics that were their bread and butter, EC had a genuine genius in editor/writer Harvey Kurtzman. Best known for creating the subversive manic satire of MAD magazine, he also wrote bleak, realistic war comics set in the then current conflict in Korea that were nothing like the chest-thumping jingoism more common at the time. But it was chiefly the horror and crime comics that garnered the attention of psychiatrist Fredric Wertham, who suggested (with very little hard data) in his book Seduction of the Innocent that comic books, even titles like Superman and Batman, were the cause of abnormal adolescent behavior and juvenile delinquency. Of course he considered comics strictly a children's medium, as did most adults at the time. Hadju points out, though, that a third of the audience for comic books were adults over 18 (GIs were a substantial number of this adult audience). Nevertheless, televised congressional hearings were held in 1954 by Senator Estes Kefauver that resulted in a new industry self-censorship board, The Comics Code Authority, which made sure that all comics were bland and inoffensive (the words Weird, Crime and Terror were even forbidden as titles). EC's line of horror folded, with the exception of MAD magazine, which switched to a larger magazine size to avoid the strictures of the code. Hadju includes a 15-page appendix that lists artists who never worked again after the introduction of the code. The comic book industry was gutted. Hajdu, previously the author of biographies of Billy Strayhorn and Bob Dylan, tells this story of an early skirmish in the culture wars with fascinating detail. Though other books such as Gerard Jones' recentMen of Tomorrow have chronicled the birth of the comics industry, Hadju casts a wider net and situates the phenomenon of cheap pulp comic books within the post-war social history of the times, and shows how its perceived threat in the '50s was a precursor to the moralistic hysteria that would attend the youth culture ascent of rock 'n' roll just a year or two later. The repressed form did return, however. The adult comic book was driven underground, but less than 15 years later EC aficionados like Robert Crumb would create their own underground comics in the '60s that made the excesses of EC pale in comparison.